Hallelujah for HONOR, RESPECT, and AVENUES to celebrate the SELF, my spiritual pilgrim, and OTHERS who accompany me in this GREAT MYSTERIOUS JOURNEY. Hallelujah for the CREATIVE ARTS that provide highways, middle ways, and low ways to EXPRESS our souls! 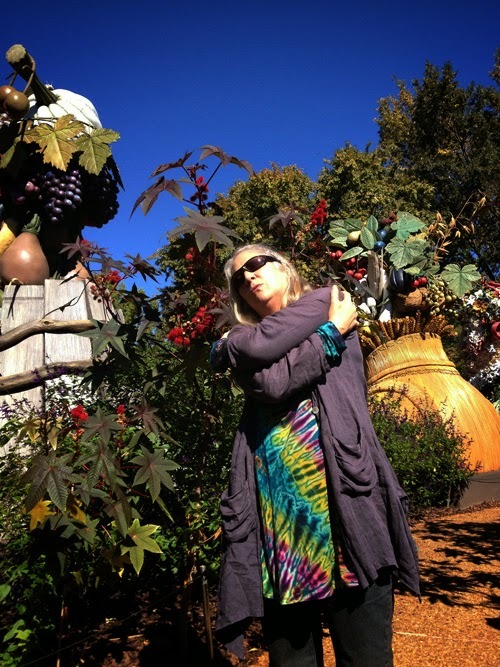 On the day before Halloween, I chose to DANCE on behalf of MYSELF at the Atlanta Botanical Garden. My inner child had become frightened and recoiled in response to all of the gory Halloween decorations in my Decatur neighbors' yards. For weeks, as I walked (part of my daily practice), I witnessed death in armies of skeletons, horror in zombie screams, blood flow in decapitated heads, and tortured baby dolls. I feel embedded in a culture I don't recognize as mine. Recognizing that I had "embodied" these horrific front yard Halloween messages, I knew I needed to "exform" them. That is...get the negative messages of death and human pain and suffering out of my body. 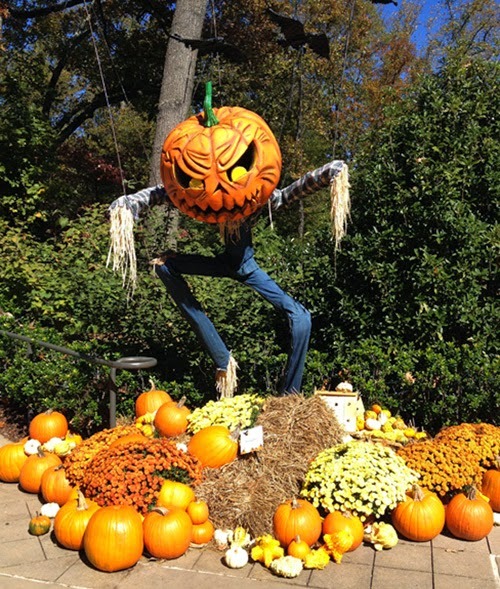 The warm fall sun shone on green foliage of towering trees, flowering shrubs and end of summer season flowers at the Atlanta Botanical Garden. Big and small orange, yellow, and speckled pumpkins plopped on hay bales and framed by chrysanthemums sparkled in golden dappled light diffusing through tree branches. Accompanied with good friend Christine Gautreaux, I DANCED on behalf of the little girl in myself who needed comforting. I DANCED on behalf of myself to release the pain of those who have suffered. I DANCED on behalf of the sorrows related to losing our loved ones to death. As I released or "exformed" this heavy sorrowful information, I experienced love of myself. Dancing my concerns honored me and others. My feelings were respected. Added to that? I was witnessed by my friend Christine. Pilgrims we are not alone in this journey. We have each other and many ways to share our experiences. Thank you to InterPlay who have given me the tools and forms to "exform," "dance on the behalf of," and "witness." That's Coffee with Hallelujah! SOUL BLOG with me and tell me how you will HONOR YOURSELF today and tomorrow. 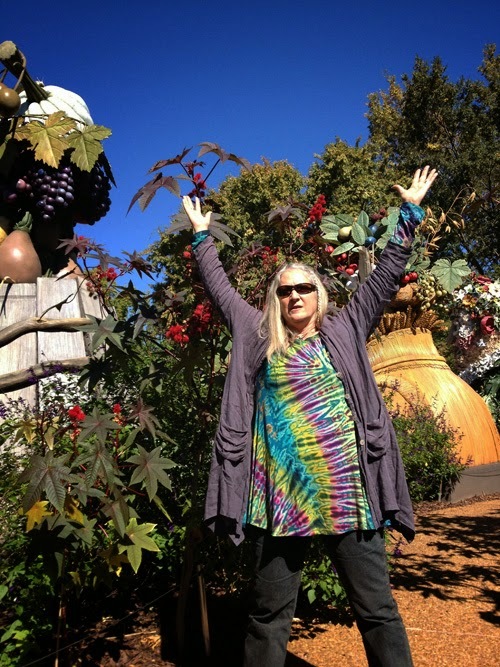 Here is a slide show of my time at the Atlanta Botanical Garden with Christine. We went there for many reasons: To be together, to study our InterPlay materials as we "play" towards becoming InterPlay leaders, to walk, to celebrate fall and to perform one of the 25 ways to play at celebrating #interplay25! Dance AND nature. What a great combination!!! Usually I do one or the other (dancing in the privacy of my own home to music that moves me). I enjoyed watching your slideshow of the beautiful Atlanta Botanical Gardens. Thanks for the inspiration! Thanks for visiting my blog and leaving a comment Elda! I understand about dancing privately too! That is awesome! So much to respond to here. Hallelujah for finding a way to express your need for comfort and for dancing on behalf of yourself and your loved ones. Halloween has never been my holiday, a good friend passed at Halloween back in 1992 and I don't think, I've ever quite recovered from it. For me Halloween marks a long season of recalled grief which lasts until New Years. Thankfully this year, I've been a part of the Daily Creative Practice and the "Deadly Creative Practice" helped me to find humor in Halloween. I still can't dance on behalf of those who have passed and I'm still very private in my grief, but one of these days, I might let it all out. Cheers to you for dancing in the face of death, and I remain in awe of your creative effort with the "slide show"
Trish...I appreciate your honesty and how you trust yourself and tend to your heart as needed. What an amazing journey we are on here in this life and am so thankful for your presence on the Daily Creative Practice! Great Blog Ruth! So glad I was able to be there and "witness" your amazing dance - it was beautiful! And all that you "played" with too Christine! Fun and heart warming! Dancing is how I connect with myself as well, my soul expressed through the movement of my body. It's how I connect when I'm happy, when I'm sad, when I'm angry...it's the full range of emotion. I'm glad you were able to work through your Halloween discomfort in such a lovely setting. Thank you so much Susan! You have such wisdom. I'm so glad we share a love of dancing as a way to express our souls! Oh Michele! Yes to trust and following our urges. So glad you had your Reiki session as a result of your deep knowing. Oh Susan! How lucky you are to have woodstorks and to BE a part of their stillness! great post - I love the music to the video - great job! what a fun afternoon - yes - I need to dance more! Vickie I savor favorable remarks! Thank you for your warm compliments. Any time you want to go to the Atlanta Botanical Garden and dance, I will go with you! My membership will get you in! Hallelujah, What an interest trip I just took exploring your site! Good for you on your nature dance & your creative journey. Today, I honored myself by consciously following my body's rhythms . . . creating in my studio, working at the computer, cooking, running errands, spending time with family. Big intake of breath and release when a sound! Your day sounds just right! Yes to following body rhythms! I love to dance.....it is so essential to my being on so many levels. So naturally I'm loving your post about "the dance" and all it's healing effects on the soul! 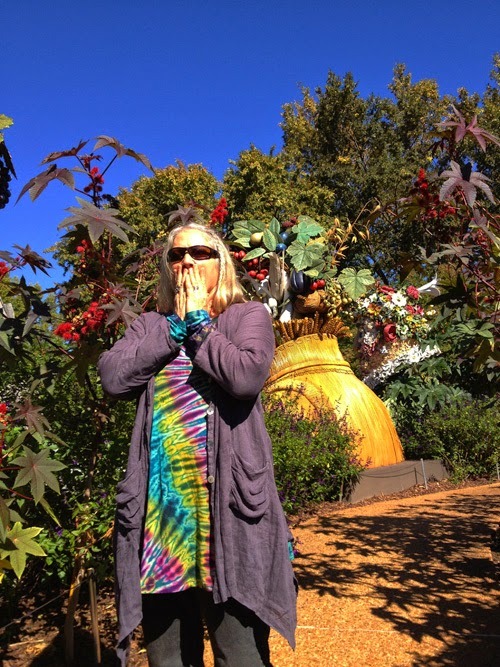 How fun to be introduced to your blog and get to meet the dancing you and enjoy a peek at a botanical garden. Love the term "exform" and love how you express yourself.